The Resistance Order screen is a place where you can work with other resistance factions in order to coordinate your plans against the ADVENT. 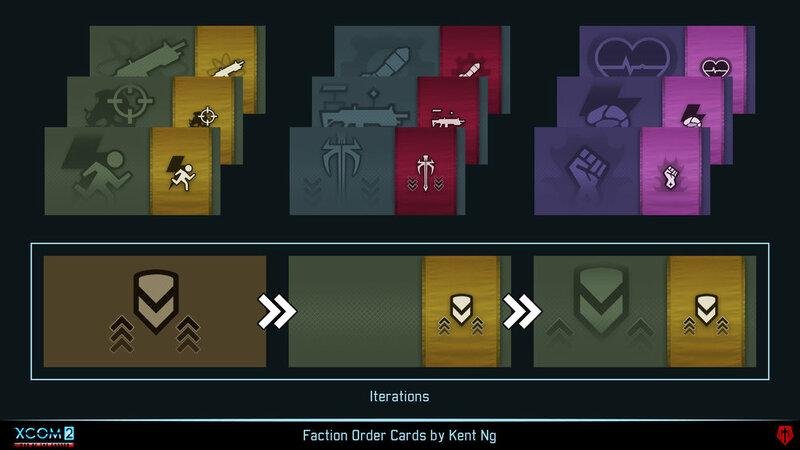 Playing through the story line will reward you with faction specific 'Orders' that you can then assign to each of your comrades. My tasks with this feature, were to design the layouts of each card. Our challenge was the sheer amount of information on each small card. While one or two lines doesn't seem like much, it was a struggle to find room to display the iconography without being too cluttered. We were initially able to solve this by creating a dedicated space on the right-hand side of the card to represent the icon. The problem we then ran into afterwards, was that when the player has amassed multiple cards, the icon would be concealed and there was no representation on the left side. While a simple solution, we resolved this by displaying a toned-down icon hidden beneath the usual description.